When there is talk of a business transformation of this scale, comparisons with GE's former CEO Jack Welch are inevitable. 'Neutron Jack's' bestseller Straight from the Gut for years hasbeen read by anyone who reads business excellence. Both Jack and 'Le Cost Killer' Ghosn appear very logic driven and straight, though by his writing style, Ghosn appears more sophisticated. You may even ask the question, what is new in this book? Same old recipe of cultural sensitivity, growth in market share, product innovation, cost -cutting etc! Don't be fooled by the simplicity with which it appears in the book. It is Ghosn's writing style to stay away from hyperbole. 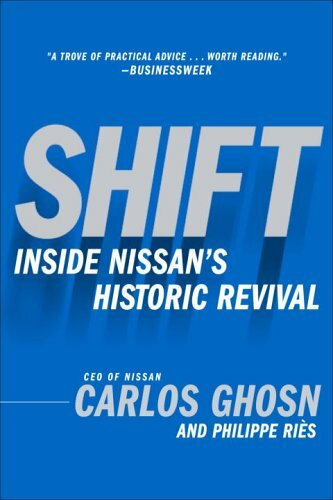 This book also shows the deftness with which Ghosn handles the cultural issues ( Not just the western style vs Japanese style but the difference in the companies as well). Perhaps it has to do with his exposure to different cultures at an early age. Like all great business leaders, Ghosn appears transparent and wants to keep his communication simple to understand. The 180 strategy is a manifestation of this simplicity. From readability point of view, it holds your attention without becoming too taxing. And perhaps this book is translated from French, personal touch seems to be missing at points. But if a book has been written by a business leader as tall as Ghosn, you cannot miss the point. Read it , when you can. Will read SHIFT soon. From your review, it seems to be an interesting read.